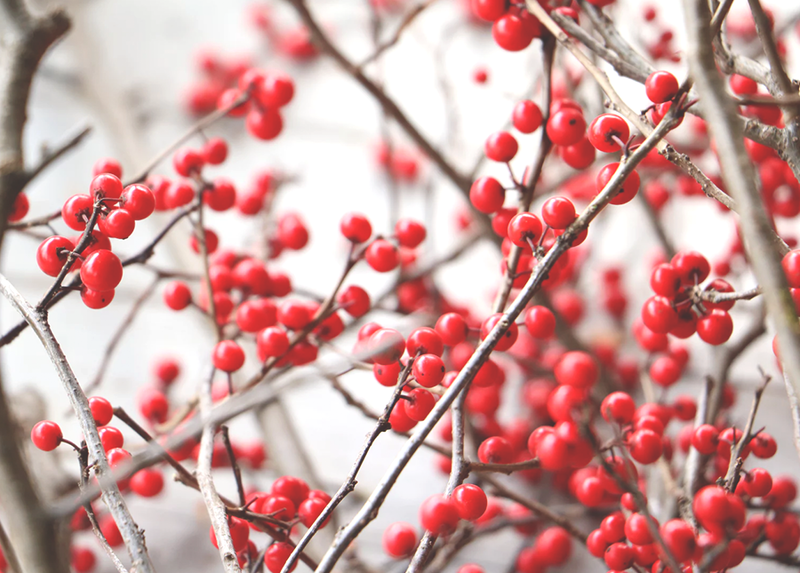 I love the holiday season, but I have a huge family — I’m the oldest of ten children — and a group of close friends. Once you throw in the usual social, work, and community obligations, the end of the year can easily become a financial nightmare if I let it. In order to actually enjoy the holidays with a minimum amount of stress, I build a spreadsheet in mid-November to manage my holiday spending, from buying the actual gifts to donations to charity. This is my third year tackling the holidays this way, and it is how I survive the last six weeks of the year. The very first thing I do is figure out how much money I can comfortably spend on the holidays. My personal strategy is to set money aside every month specifically for Christmas. That way I know exactly how much I can spend without touching a single cent of my normal budget. One of my friends saves up all of the rewards points he earns via his Amazon credit card and then pays for his gifts with the accumulated points. Another friend earmarks a portion of her annual bonus, and a third devotes most of her December entertainment/fun money budget for gifts. Whatever your method is, the critical thing is to determine upfront what you can afford to spend, and then commit to that number. My next step is to create the spreadsheet. I make a list of all the people I want to give a gift to and all of the things/events I will spend money on that aren’t part of my regular monthly budget. My spreadsheet gets divided into three sections at this point: family, friends, and miscellaneous. Family and friends are self-explanatory, but miscellaneous is a far wider category: wrapping paper, cards, postage, food for the office potluck/family dinner, etc. Maybe your family has a tradition of attending a production of White Christmas at the local theater, your friends get together for hot chocolate and fuzzy sock exchanges, your work selects a charity to support, or you like to make gigantic batches of cookies and candy to give away to your neighbors. Do you need to travel for the holidays? Are there people you want to give a generous tip, like a frequent house-, pet-, or babysitter? Do you always pledge money to your city’s homeless shelter when they call? All of these things count as holiday expenses. Next comes the most emotionally fraught part of the process: assigning a dollar amount to each of the people, events, and items on my list, and then comparing the initial total to the amount I already determined I can comfortably spend. Maybe you’re a wizard when it comes to estimating and can nail it on the first try, but I normally end up having to fiddle with the numbers until they work out. At this point, I usually spend a couple days figuring out if I’ve forgotten anyone or anything and jotting down gift ideas. 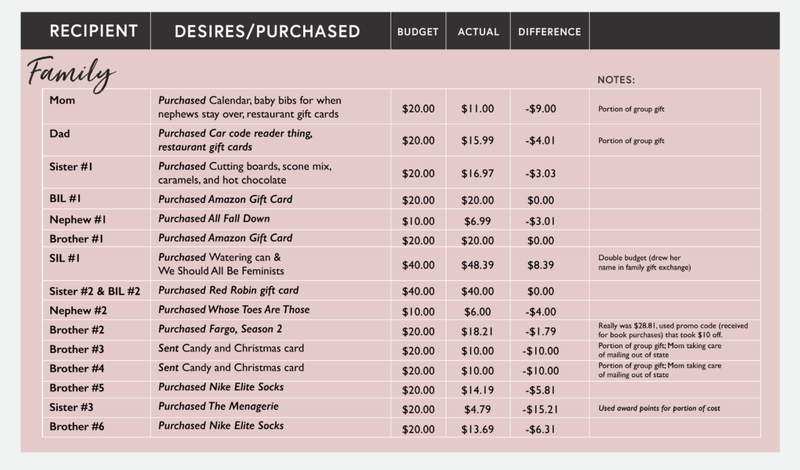 You’ll notice that, once I’m ready to begin shopping, my spreadsheet serves as a way to keep track of what I’ve already purchased, how much it cost, and if I’m on budget overall. I also add a column for notes, like whether the price was subsidized by award points, if something has been packaged but still needs to be shipped, or if I’m still waiting for part of a gift to arrive. Last year, I gave gifts to twenty-seven people, and my spreadsheet kept me from experiencing that awful I-forgot-someone panic — or forgetting that I’d already purchased a gift for them. Just like a regular monthly budget, if I go under in one category, I’m okay with cheating a little in another. If I get a great deal on Brother #1’s present and end up under budget for him, that means I can go a few dollars over without guilt for the perfect gift for my mom. The overall budget limit is the most important number, and as long as I don’t exceed that, it’s fine if I’m not perfect at every level. After all, the purpose of my spreadsheet is to ensure I have the most financially responsible holiday season I can, while still letting me do all of the things that make the holidays enjoyable for me: giving gifts, having fun with friends, and donating to charity.